Some of the sheep team have just published a new map over at the Information Geographies project. 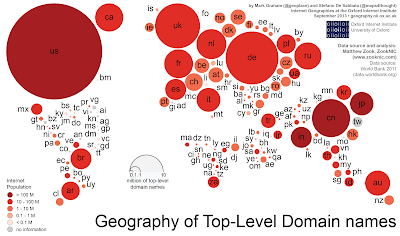 This one draws on some of Matt's long term research into the geography of domain names which dates back more than fifteen years. Egads, where did the time go?. The map offers a detailed overview of one-facet of the geography of content production. While not the normal kind of user generated data we use in our work at FloatingSheep, domain name registrations are an indicator of content production. Some results are unsurprising (for instance the low scores in many countries that have low numbers of internet users). However, other unexpected patterns also reveal themselves (such as the relatively low numbers of domains in many Asian countries). For a more detailed description of results take a look at the discussion on the map's Internet Geography home. Also, to give some perspective on how much things have changed, here is map of .com domains in San Francisco (and zoomed into just the South of Market region) back in 1998 when there were less than 2 million rather than 110 million that exist today. If you are interested in reading more domain name work check out. Zook, M.A. (2005). 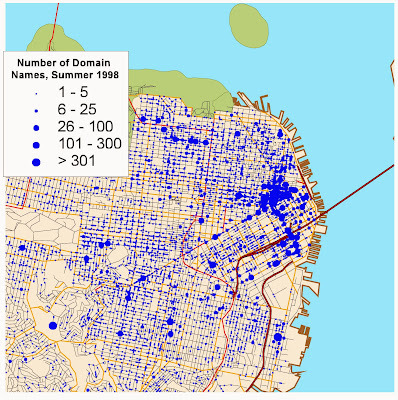 The Geography of the Internet Industry: Venture Capital, Dot-coms and Local Knowledge. Blackwell Publishers. Zook, M.A. (2001). Old hierarchies or new networks of centrality? The global geography of the internet content market. American Behavioral Scientist. (June). Vol 44. No. 10. 1679-1696. Zook, M.A. (2000). The web of production: The economic geography of commercial internet content production in the United States. Environment and Planning A. Vol. 32. 411-426.